This week in language arts our phonics and spelling rule was -ee and -ea. We practiced this with poetry, decodable readers, word sorts and our spelling words. In grammar we learned about common versus proper nouns. We also reviewed the comprehension strategy of main idea by listening to the story Winter By Gail Saunders Smith. We identified the elements of informational writing in the book, and filled out a graphic organizer with the main idea and details of the book. In the spirit of the new year, we listened to Squirrel's New Year's Resolution by Pat Miller. 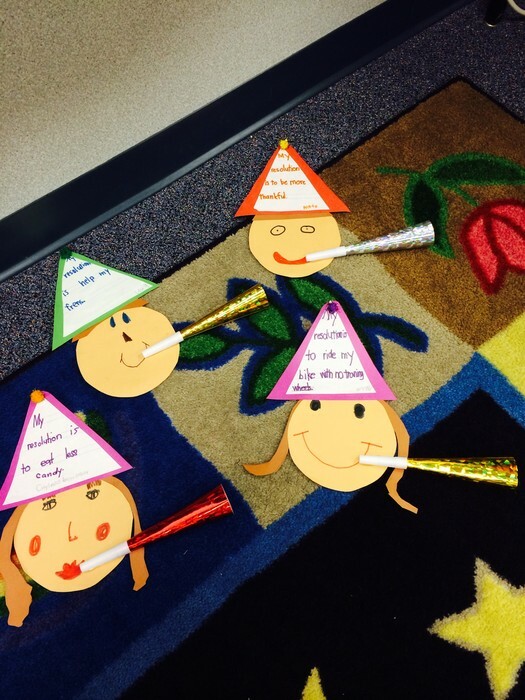 We brainstormed our own resolutions and wrote them out on a celebration hat that we put on top of faces that we cut out and decorated. 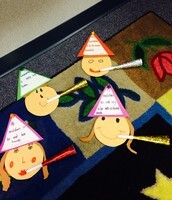 We completed the project by gluing party horns to our mouth in celebration of the year ahead! We continued to practice reading with inflection and fluency in our guided reading groups and reviewed our story elements when retelling the stories we read. In our literacy centers we wrote about our favorite part of winter break, reviewed abc order, sorted nouns and verbs, read and answered comprehension questions to a short story, and worked on the iPad to continue to practice telling time. In writer's workshop we finished publishing our final copies of our small moment stories and enjoyed sharing them with the class during our publishing party! 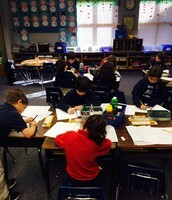 In math we continued working on chapter ten which is about time and calendar. We reviewed A.M. and P.M. and elapsed time. We also reviewed the elements of a calendar and filled out a January calendar, as well as answered calendar questions using different months of the year. We practiced thinking about how long things take (minutes, hours, days, weeks) and compared different lengths of a time with different activities to show our understanding of how long they would take. We will be beginning a new science unit on Matter. To introduce the unit, we brainstormed what we know and want to know about solids, liquids, and gas. We look forward to exploring matter with lots of hands on experiments in the weeks to come! Tu Bishvat טו בשבט is such a fun, important holiday! This week the children sang Tu Bishvat songs, read Holiday stories, learned about our role as Jews in keeping the earth and the environment and especially about the importance of trees in our lives. Our ARIOT letters were: כּ KAF, כ CHAF and ך CHAF SOFIT. The verb this past week wasכּוֹתֵב -write (KOTEV). This week in Jewish Studies we spent some time reviewing our Torah stories. 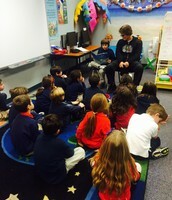 The students were split into groups, assigned a story, and given time to create short skits that retell the stories. They were very creative in their performances and showed a great understanding of the content we have learned! We are looking forward to moving on in the Torah next week. Happy New Year! We started the week off with very cold weather and an unexpected day off on Tuesday but we are now back in the swing of things and looking forward to everything we will learn together in the second part of first grade! Thank you to Gregg Notte for being our mystery reader on Monday! I hope everyone has a fantastic weekend! Friday, January 17: Field Trip to Jewish Home from 10 a.m. to 1:00 p.m. All parents are welcome to meet us at the Jewish Home for the field trip. Wednesday, January 29: 100th Day of School! 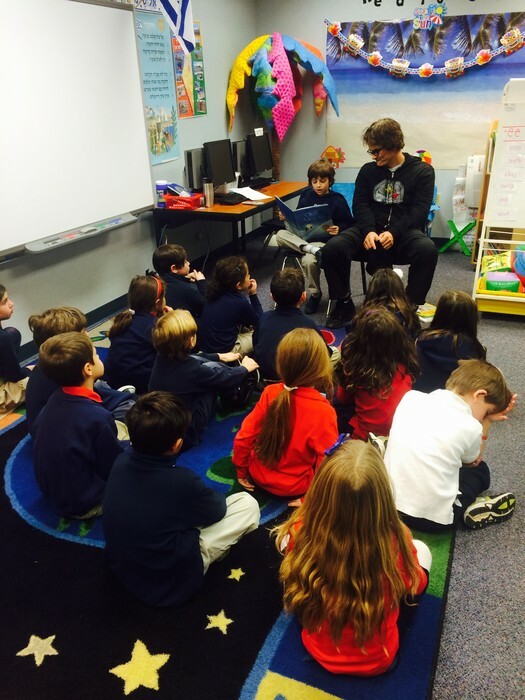 Friday, February 21: Kabbalat Shabbat led by our class! 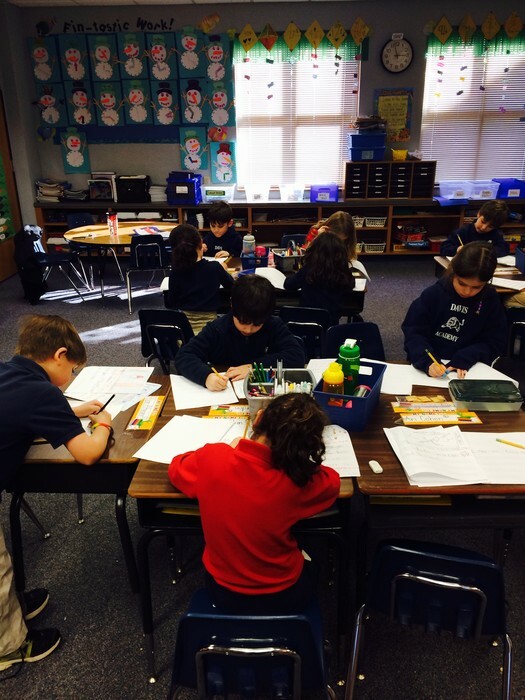 Publishing our Small Moment Writing!